On the 10th of June 1987 I drove north in a rental car from Brisbane to Noosa Heads. There was a continuous urban settlement between the highway and the coast pretty much all the way, but when I got the ferry across the river at Noosa Heads I had left civilisation behind. One of the keepers from Double Island Point met me and drove me along the long beach to the lighthouse, about fifty kilometres. Cherry Venture wreck with distant lighthouse. Arca-Swiss monorail 5×4″, f5.6 20 minutes, 150mm Linhof Schneider Symmar, Fujichrome 50. And here it is, the Cherry Venture, emerging out of the sand like a Marie Celeste with Double Island Point lighthouse in the distance. I’m not sure whether this was on the way to the lighthouse or whether we came back later. It’s a long slow process setting up for exposures on large format film. The initial exposure here was probably a minute or two, but each time I measured the exposure halfway through it had doubled. The exposure ended up at 20 minutes and it was pretty dark by then. I started wondering whether a supplementary light source would work and I suddenly realised I had a lighting kit with me, otherwise known as Landrover headlights. So I shut my exposure down, got the keeper to point the Landrover at the Cherry Venture and measured the light. Then I added a supplementary exposure with the headlights and that is what you see here. 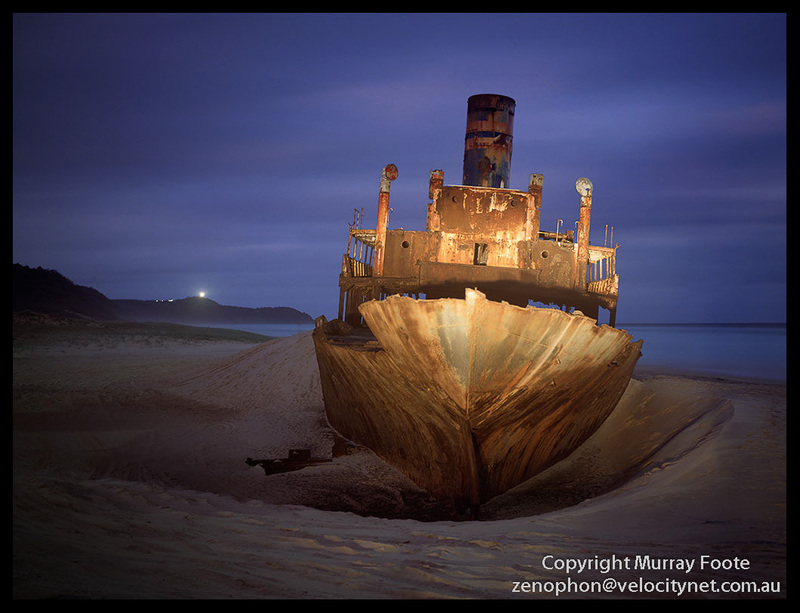 The Cherry Venture ended up on the beach in 1973. It was sailing from Brisbane to Auckland when it was driven up on the beach by a combination of huge storms with forty foot waves, and because it had no cargo. You can read the story of this on an ABC (Australian Broadcasting Corporation) page here. Someone bought the salvage rights soon after it ran aground. First they tried to refloat it but did not succeed. Then there were repeated attempts to strip the ship of all its metal. That didn’t work out so well though and they abandoned the salvage attempt. A keeper told me there was at least one occasion when a truck laden with metal sank down in the sands and was claimed by the tide. I took this exposure the next day when a lighthouse keeper took me back along the beach. This is more from the rear of the boat and it must be close to the middle of the day. I could give you the GPS coordinates to go and search for the wreck but it wouldn’t do you much good; it’s not there any more. It had rusted away over the years and the authorities determined it was unsafe to climb on but they couldn’t keep people off it so it was removed from the beach in 2007. This entry was posted in Australia, From Dusk Till Dawn and tagged Australia, Cherry Venture, Double Island Point, History, Landscape, Lighthouses, Photography, Queensland, seascape, Travel, Wreck. Versatile things Landrovers: carry your photographic kit anywhere! and be part of the kit as well…. great image by the way. Great piece Murray. Love the next one about the Lighthouse too, but this old ship is (was) terrifically atmospheric. Sad to read it’s been removed now, although that action possibly saved some kid a leg or something. Enjoyed the technical tips about the use of land rover headlights too. Hope all is well- Arran. Thanks very much, Arran. Yes, all is well, though I’m wasting some paper at the moment, making mistakes as I print a couple of images from Patagonia. Murray, this is a great pic, I would love to have it on my wall. As a youngster I climbed on the Cherry a couple of years after you took this frame. Do you sell your pics? Regards. Yes, I can do that. I’ll send you an email. Thank you for your excellent site. Beautiful text and beautiful photography. 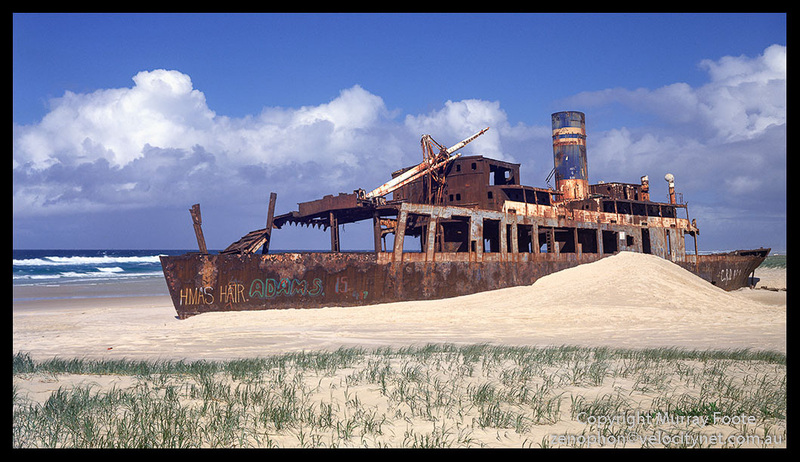 I am just finishing the last bit of writing of my children’s novel about the wreck of the Cherry Venture. My editor has asked for the name of the lighthouse keeper when the ship ran aground. Would you be able to help me out here with his name? Perhaps you may also enjoy my husband’s photographic website Poems with Pixels at Looking forward to hearing from you. Thanks very much Alison. No idea on the name of the lighthouse keeper. You could try asking AMSA but a response might depend on how easy it would be for them to access that information. I couldn’t find your husband’s site just from a web search. They generally had three families in traditional lighthouses so they could rotate eight-hour shifts. That must have been amazing to stay on the ship. There must have been more of it then than when I took the photo in 1987 (and of course it’s gone now). I found the web site. Lots of intriguing photos. And using JAlbum – I also use that for my live music images, though more of a repository than for presentation. I don’t have my first camera and probably not the first four or five. I accumulate cameras rather than collect them. I’ve given some away and sold the occasional lens and from memory have 19 cameras and 29 interchangeable lenses. In film I have 35mm, 6×6, 6×17 and 5×4 and in digital I have a Fuji system and a full-frame Nikon system.